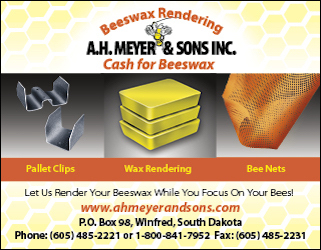 My interest in honey bees began in the Fall of 1989 with a visit to my office by a client who was contemplating retirement. He told me that he wanted to set up some bee hives. As an experienced woodworker, I thought the construction of the boxes would be fun, and I volunteered to construct his bee hives. Over the next six months, I assembled six deep supers, 18 shallow supers, and the associated 200 odd frames in the evenings. 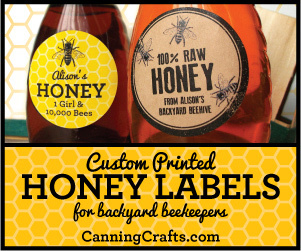 At the appropriate time in the Spring of 1990, I installed a three-pound package in each of his six hives. I was disappointed to let them go; I was hooked; I had to get bees of my own. Thus began my beekeeping experience. Scroll forward 10 years, on my first trip to Ukraine in June of 2000, I had the opportunity to visit some beekeepers that lived out in the country some distance from Feodosiya. I was staying in the town of Prymors’kyi, which is right on the Black Sea. One day, we rode out away from the city for about an hour. As a passenger, I was not paying attention to the direction we headed. Wherever we were, there were lots of fields. We stopped to talk to another beekeeper who wanted to show us his hives. We walked up to the rear end of a large trailer, climbed the steps, and proceeded to the front where he had a small enclosure about the size of a walk-in closet. Inside were a bed, an extractor, and a small workbench with tools. 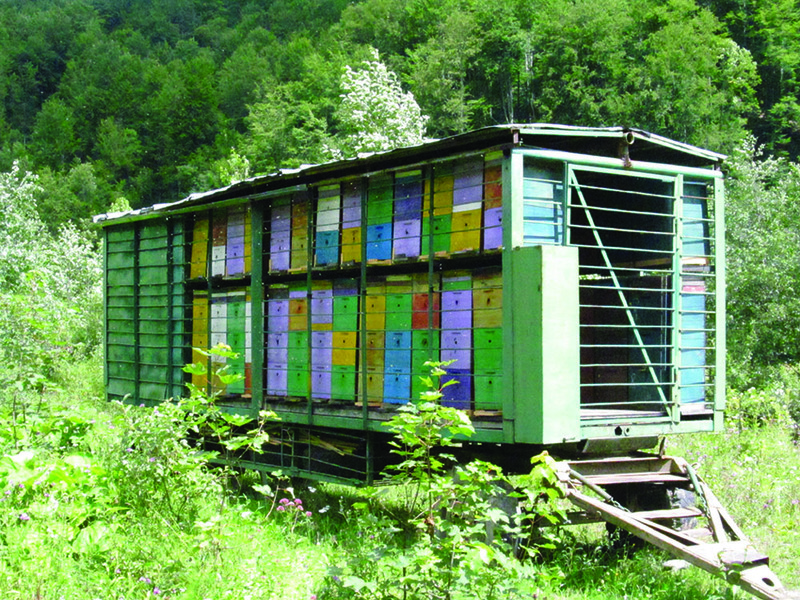 The beekeeper could stay overnight at this trailer and extract honey and repair woodenware, if necessary. Because no one had said anything about donning protective gear, I assumed that all these boxes were empty supers that he had stored on the trailer. One stack of supers was on a platform scale. When we exited the trailer, I realized that all those stacks of supers were actually hives. There was a hive sitting on the platform scale. The hive on the platform scale enabled the beekeeper to monitor the nectar flow. At the time, this hive on scales did not impress me. I thought I knew when my bees were bringing in nectar. Scroll forward to May 2008. 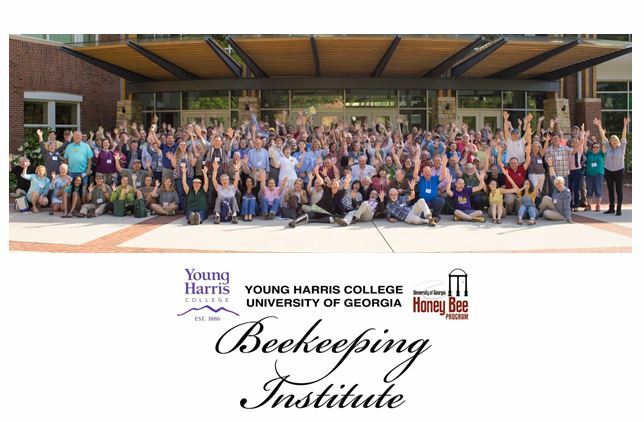 One of the speakers at Young Harris Beekeeping Institute was Dr. Wayne Esaias from Maryland. Dr. Esaias gave a presentation about his scale hive. “Scale hive” is how he referred to his hive on a platform scale. The amusing narrative about his son’s accepting the offer of a hive of bees from his Scoutmaster, who was moving out of state and did not wish to take his hive of bees with him, then asking if it was OK with his dad reminded me of the challenges of being a parent. 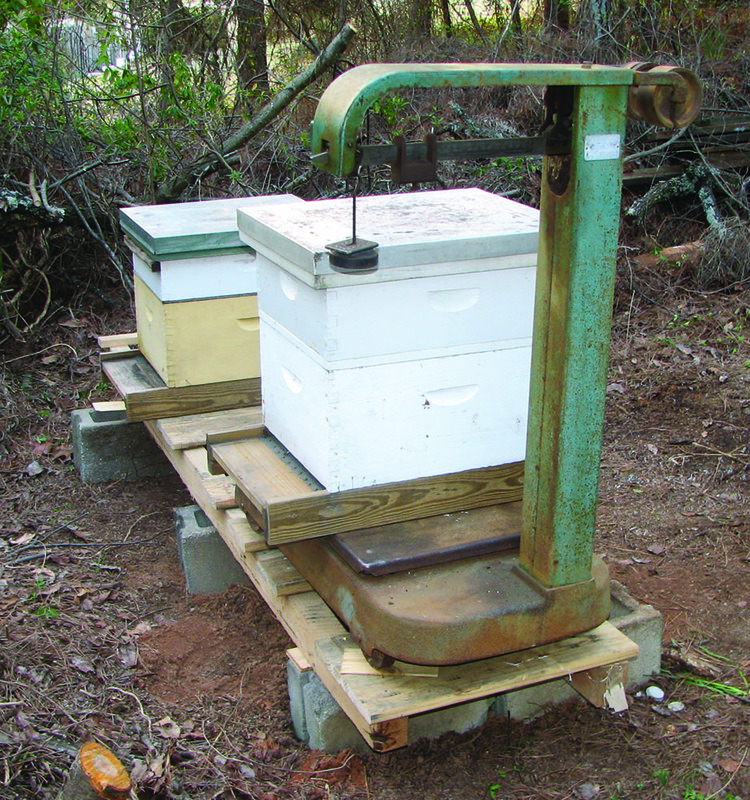 The hive that Dr. Esaias acquired came with a platform scale. I recall his saying that his son acquired this hive in 1991. Consequently, Dr. Esaias had a bee hive on a scale that enabled him to monitor the weight of the hive. 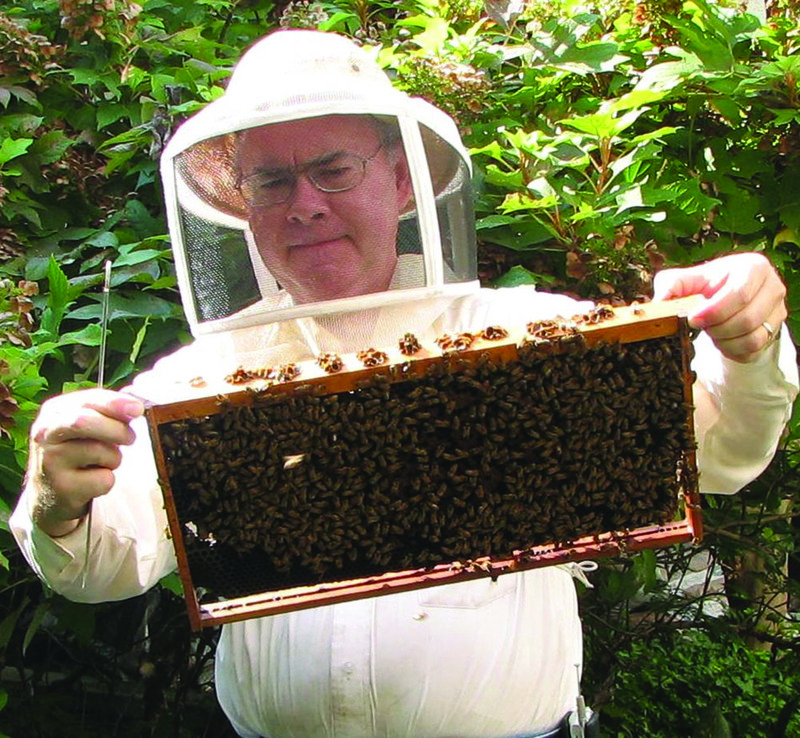 He had accumulated data on the daily weight change of his hive for 17 years. 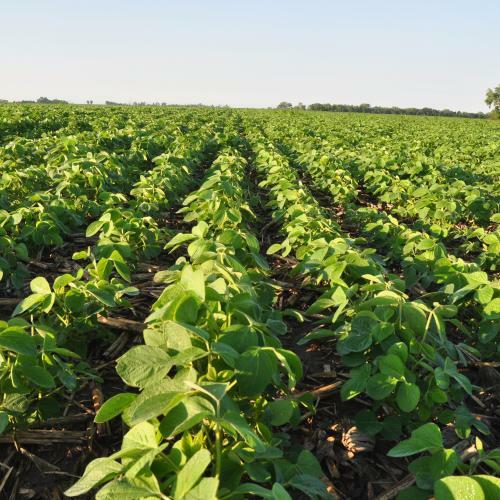 In July 2008, Dr. Esaias was a speaker at the Heartland Apicultural Society meeting at Marshall University in Huntington, West Virginia. Again, I attended his presentation about his scale hive. 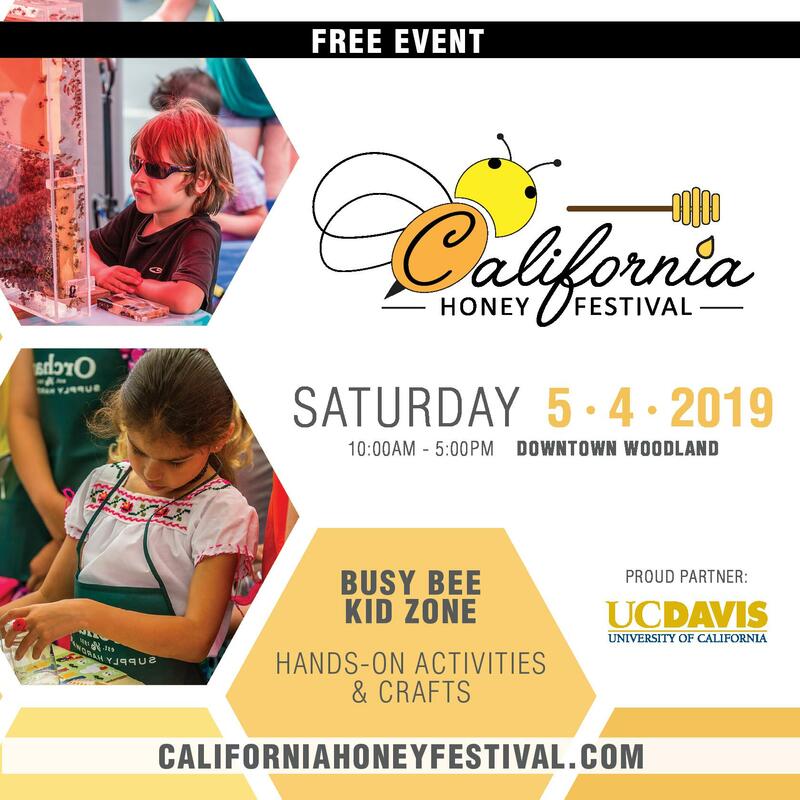 At this presentation, Dr. Esaias elaborated on the scale hive that he had brought to HAS with additional information about how to acquire platform scales, what color to paint the scales, how to protect the scale from the weather, and maintaining the daily record of change in hive weight. Of most importance, Dr. Esaias stated, “If the platform jiggles, they probably are OK.” Later on, I realized what he meant. My interest in obtaining a scale hive increased. Upon my return home, I made an unsuccessful attempt to bid on a Fairbanks-Morse scale online. Don’t let me discourage you from attempting to purchase your scale online. I am sure my experience was singular. Mine was the only bid until less than an hour to go; then someone outbid me. That’s OK. But the next day I received an offer by e-mail from the seller. I did not respond. After my unsuccessful online experience, I placed an ad in the Alabama Farmers and Consumers Bulletin. The day the paper came out, I got a call from a gentleman with a Fairbanks-Morse scale for sale. Also, he lived only about thirty minutes from me. The scale had a capacity of 1,000 pounds. A scale with a capacity of 500 pounds would have been slightly more desirable. It has to do with the precision with which the scale can measure. A 1,000 pound scale measures to the nearest ½ pound. A 500 pound scale measures to the nearest ¼ pound. All the steel parts had some rust; the sheet metal platform was rusted through in places. However, as Dr. Esaias had said, “If it jiggles, they probably are OK.” Well, mine jiggled. The steel wheels did not roll; I had no plans to move my scale, anyway. Also, there was a device at the end of the balance arm that was rusted in place. I soon discerned that this lever and cam mechanism prevented the balance beam from banging around while a load was placed on or removed from the platform. Over the next three weeks, I squirted the rusty part with penetrating oil and tapped on it with a small hammer. Eventually, the rust turned loose, and the lever moved as designed. I never really attempted to get the wheels to roll. The fine tuning mechanism that would zero the scale was totally beyond movement. During that Winter, I weighed stuff just because I had this platform scale. I acquired my Fairbanks-Morse scale in September 2008. It would be Spring 2009 before I put a hive on them. During the Winter, I very carefully balanced the counterweight by drilling holes in it until the scale was level with zero weight. 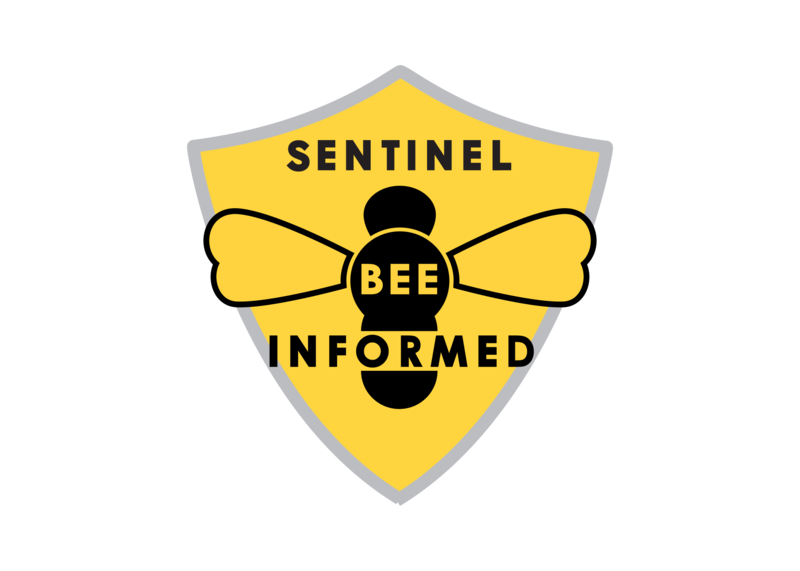 This is not terribly important since the information to be recorded is the daily change in the weight of the hive. The accurate total weight of the hive is of secondary importance. If I did need to weigh something accurately, I could always put a known weight, such as five pounds, on the scale and determine the amount to correct the actual weight. I haven’t needed to do that in six years. The next Spring, fellow beekeeper, Wil Montgomery, and I constructed a special hive stand for the scale. There were already two colonies on a hive stand at the spot where I intended to place my scale hive. We placed some concrete blocks that were set level. It is important that the scale be placed on a level surface. We then set the colonies back in place with one colony on the scale. On March 7, 2009 I began my daily recording of the weight of my scale hive. It has added a new dimension to my beekeeping. It is almost as if I knew nothing before, and now I know something. In the spring, as I monitor the daily change in the weight of the hive, I eagerly await the day that the weight stops declining. On that day, I can add a super with confidence knowing that something out there is producing excess nectar. During that first season in 2009, I recorded daily gains of one or two pounds, maybe three or four pounds. In my location in north-eastern Alabama, around my house, there is usually no intense nectar flow from a single floral source. In some years, we get a privet bloom. The daily weight increase in April, May, and June is fairly steady and consistent, usually. Then one day, to my shock and delight, I read a 14-pound increase in 24 hours. This must be a mistake. How could I have read the scale wrong? In 2009, HAS was held at Oberlin College in Oberlin, OH. Wil Montgomery and I attended. HAS is usually on Thursday, Friday, and Saturday. On Friday, I ate lunch in the school cafeteria with a few hundred beekeepers. 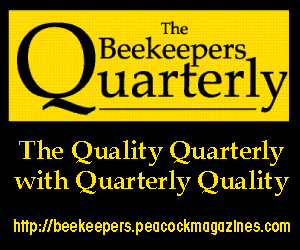 I sat at a round table with seven other beekeepers. Somehow, I cleverly worked it into the conversation that I had recorded a 14-pound increase in my scale hive on a day in May. I was expecting them to doubt the accuracy of my scale. To my surprise, their response was, “That’s not unusual. We have 30-pound days!” It turns out that several of these beekeepers were from Canada. There, they have 20 hours of daylight in the Summer. Their bees may bring in twice as much as my colony in one day. Obviously, they are also better beekeepers than I. 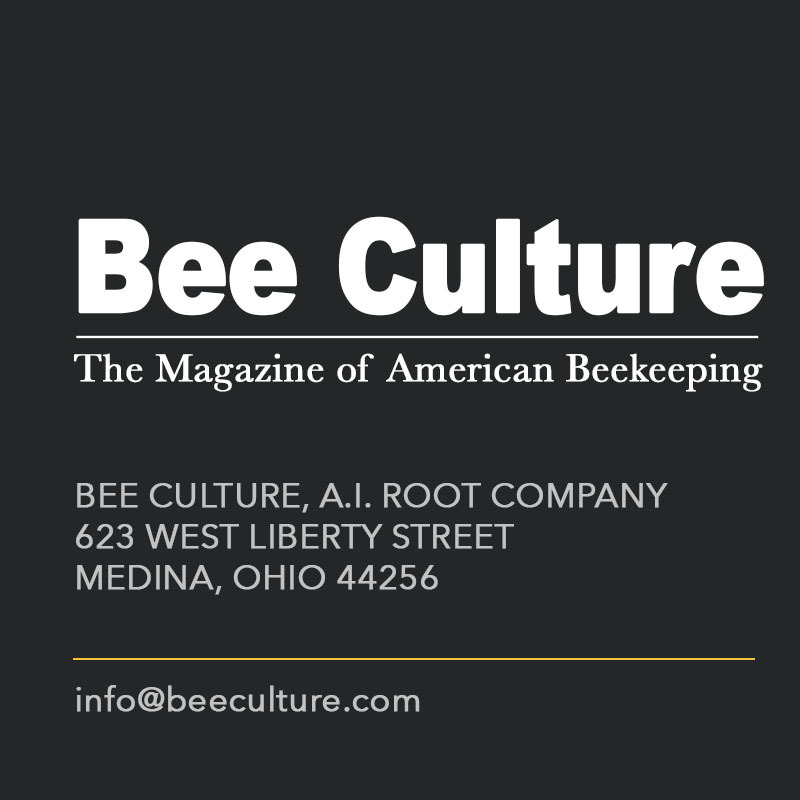 The lesson, always consider the location of the colonies whenever you are discussing your bees with another beekeeper. Back to the fairly steady and consistent daily weight gain. 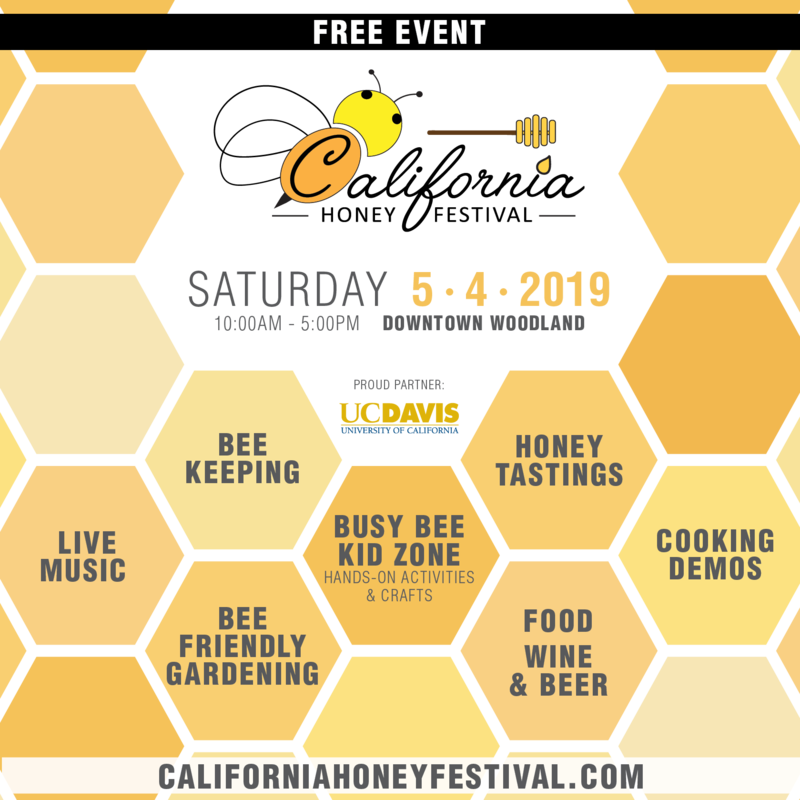 How often have you heard or possibly said this yourself, “My bees did not swarm this year.” This remark always amuses me. I suppose it is simply my nature or maybe my career choice. I am skeptical, among other personality traits. 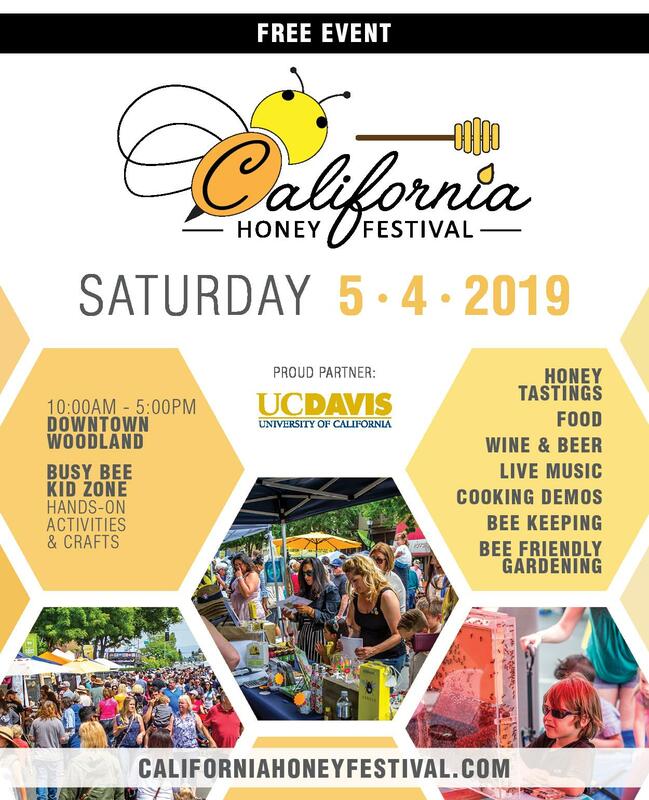 My immediate reaction, and sometimes, improperly, my verbal response is, “How do you know they did not swarm?” I envision this beekeeper camped out in his apiary 24/seven watching each colony for a swarm to sally forth. I don’t think so! Anyway, I can only speak concerning my scale hive. If my scale hive swarms, on one day, there is a four to six pound decline in weight. 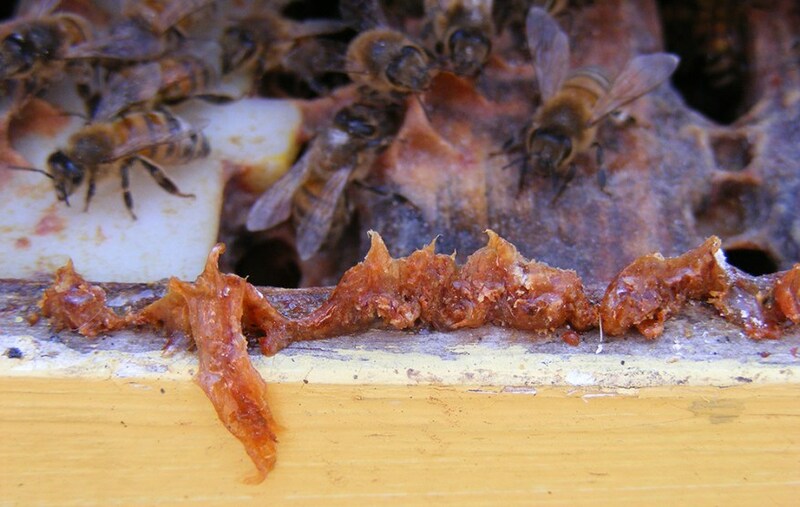 If you read Huw Evans article in the December 2014 issue of Bee Culture, he highlights Swarm! in Figure 7. So, if my scale hive swarms, I will know, regardless of whether or not I am there to observe the egress. 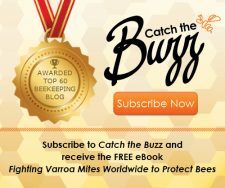 I looked into Arnia Remote Hive Monitoring at http://www.arnia.co.uk/how-it-works/. They emailed their price list to me. Very sophisticated is all I can say. Their system puts my scale hive back in the dark ages. However, I gave four quarts of honey for my platform scale. 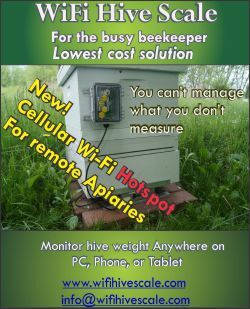 When I win the lottery, I will definitely invest in something like the Arnia Remote Hive Monitoring System. The keyword is remote. I have to walk out to my backyard apiary every night to read my platform scale. 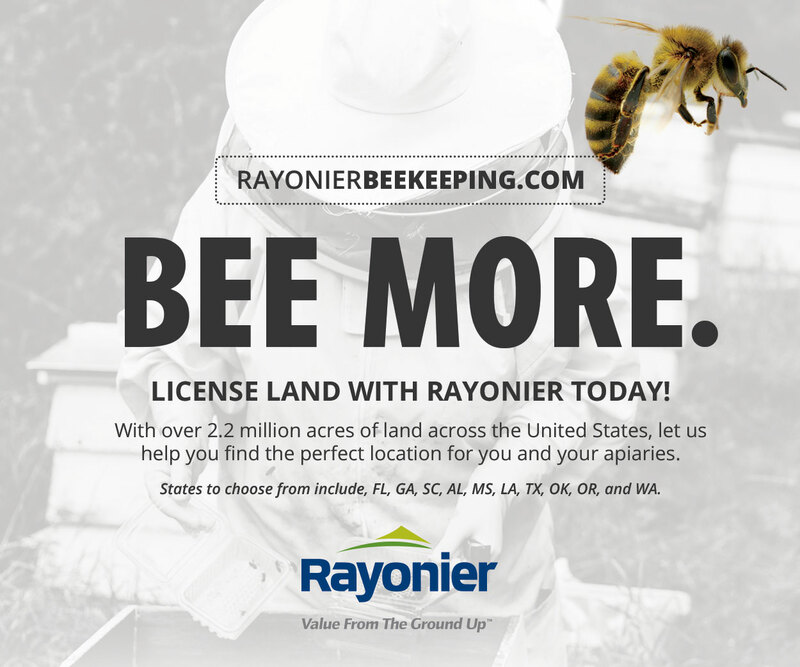 All you wealthy beekeepers (is that an oxymoron?) should read Huw Evans’ article and consider some sort of monitoring system. 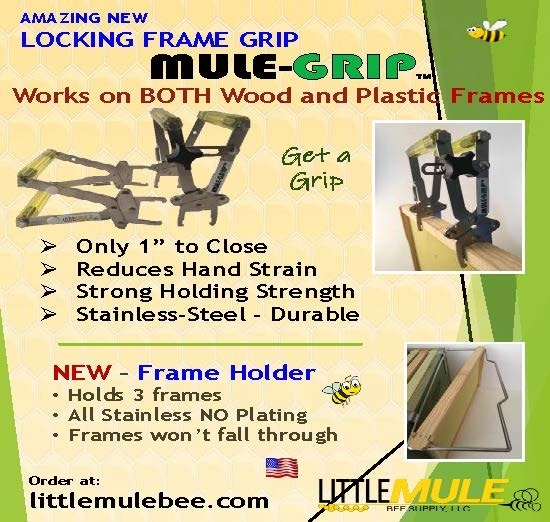 If you already have or are successful in obtaining a platform scale, and you are willing to keep a record of the daily weight of a hive and the change in weight due to all the manipulations you perform, e.g. adding or removing supers or a queen excluder, Dr. Wayne Esaias would appreciate your reporting the data to his scale hive project. 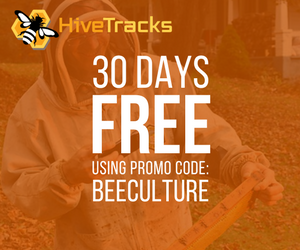 Even if you do not participate in his project, your scale hive will add a new dimension to your beekeeping. Honey bees are already fascinating. 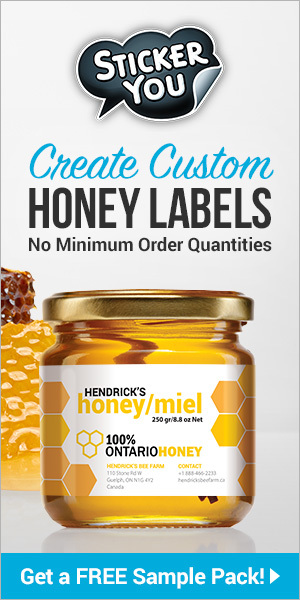 Accurately monitoring the weight of one of their hives will only add to your fascination.